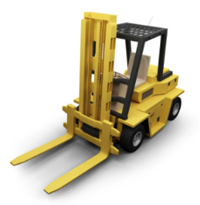 Forklifts are required to lift and carry heavy loads, shock shelves, and load shipments into the warehouse. Whether it's an entire fleet or single unit, a forklift purchase is a big investment to any company. A fork truck rental rather than purchasing a used forklift is an economical way to cut down operational costs. If your warehouse or facility requires frequent forklift rentals, or if you are a contractor who needs the fork lift on a per job basis, 123Forklift has best rental options available. With hundreds of locations across the United States, Canada, Mexico, United Kingdom, Germany, Spain and South Africa, we provide the largest rental fleet of cushion and pneumatic tire forklifts, order pickers, electric stackers, reach trucks, scissor lifts, rough terrains and boom lifts. Affordable Rates and Flexible Dates - At 123Forklift, we offer daily, weekly, and monthly rates for all types of equipment we carry. The rates of fork truck rentals are determined by equipment type, weight capacity, and timeframe. Multiple locations and a full equipment line allow us to provide competitive rates of every available forklift for rent. Schedule your preferred pickup and drop off dates to ensure the job is completed when you need it to be. Trustworthy Brands - We carry the newest forklift models available on the market. Our forklifts for rent are serviced, reliable and ready to go for all of our customers. At 123Forklift, we understand that you are not just looking for a trustworthy company to rent a forklift; you are looking for a trustworthy forklift to employ! Like you, we invest in our own forklift rental fleet by providing recognizable and quality brands. With our rental forklifts in your warehouse, you won't have to worry about the equipment breaking down and slowing down momentum. Professional Staff - 123Forklift prides itself in its customer service. Our knowledgeable staff won't just rattle off the price of forklift rentals, they'll help you determine what type of forklift you need and an estimated timeframe to complete the job. We're here to offer excellent service while saving you time and money. Our delivery service is topnotch and reliable for timely drop offs and picks ups. 123Forklift is the best place to find your next forklift for rent; we are where customers rent forklifts. To determine which type of forklift and timeframe you may require, simply complete the request form above or call our rental division at 877-326-2047.